Nearly a week. That’s how long it took me to sit down and watch the eighth and final season premiere of Monk. I was excited when I received my review copies of Psych and Monk and looked forward to being one of the first in my circle to see it before everyone else did. But as the opening scenes of Monk came up on my screen, an overwhelming sadness came over me. It was like that first day of senior year in high school–you’re happy that it’s here but sad that it’s over. So there I was, watching the beginning of the end of Monk, it’s senior year, and wishing that time would stop. It doesn’t unfortunately and neither does this review. So let’s start with the obvious. With this being the final premiere I was expecting something a bit conventional, safe, still Monkish but something that didn’t have to try very hard. After all, it’s the final season and who can blame them for coasting? Thankfully, they’ve decided to start the season with a bang and give fans a proper good-bye. And it looks like from this episode they’re going to follow the Lay’s potato chip philosophy of storytelling, you can’t just stop at just one. 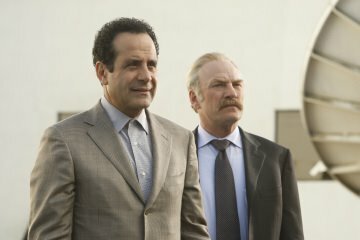 Former detective Adrian Monk (Tony Shalhoub ) becomes involved in an attempted murder case after someone sends threatening messages and blows up the car of his favorite child actress (Elizabeth Perkins), from his favorite television show (which is ironically similar to the Brady Bunch) who wrote a tell-all book. The case takes an interesting twist when Monk is asked to be her bodyguard. I can tell you more but then I’d have to kill you…or at least injure you or shower you with boxes full of wipes. There is no doubt Shalhoub knows his character well. What’s delightful about that is that you can place him in any situation and the Monk-ism come out without hesitation. Watching Shalhoub’s Monk go into total fan mode, complete with the super-precise fan trivia questions, has to be one of the funniest moments of the series. It’s a shade of Monk we haven’t seen before but always knew it was there. Shalhoub’s performance in this episode and well as the writer’s efforts, stretch Monk further than we’ve seen before. He’s still our favorite defective detective but the show’s camp is placing one foot over the cliff while the other is planted firmly on the other side. The push is not obtrusive. It’s a treat and as a fan, I’m glad they’re dangling their toes over the edge. But it’s also something that would have been out of character as early as last season. This episode couldn’t be in any other season than this one. In a way we watched Monk grow up. From the days of Sharona, through Detective Disher’s music video, and even through the Captain’s divorce and the introduction of Natalie, we were there through all of it. Monk is to the USA Network like Emeril is to the Food Network or Sesame Street is to PBS, beloved and like the cool cousin you wished would visit more. The show proved that good television could be found on cable and that anyone, despite the long list of phobias, can be a hero. Two words — Afro and Bell bottoms. Outta sight! I am still trying to figure out why this is the last season of MONK. They can't cure him and put him back on the force? That could be a whole season of trying to be MONK without the help of Natalie.Columbo went on for years-why does MONK have to stop after 8 seasons?? I know it may sound lame, but Adrian Monk is an absolute hero of mine. I realize fully that he is a fictional character but as a man with OCD and severe Panic Disorder, watching the show is cathartic. I feel your sadness. Thanks for the review. Mia, Tony Shalhoub has decided this will be the last year. He doesn't want the show to drag on until people are sick of it. Thanks Linda!It always makes me a little sad when good shows go off the air yet not so good ones stay.